8/2 Cup of Coffee: Some clutch hitting from Michael Chavis (pictured) keyed a big Portland rally. Tanner Houck was stellar in three innings of work for Lowell. Ricardo Cubillan reached base four times in a wild win for the GCL squad. Mike Shawaryn had a second straight rough outing for Salem. Roenis Elias was tagged for three home runs in a rough outing. He surrendered seven runs on eight hits in five innings of work. All of Pawtucket's offense came on solo homers. Bryce Brentz clubbed his 22nd home run of the season, while Ryan Court hit his ninth. Sam Travis went 1 for 4. 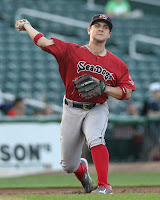 Michael Chavis kicked off and finished a four-run Portland rally for a thrilling comeback win. Chavis clocked his ninth Double-A home run in the sixth inning, then drove in the go-ahead run on an RBI single in the seventh. He went 3 for 4 on the night with a run scored and two RBI. Sandwiched in between was a two-run double from Chad De La Guerra. Henry Owens struggled with his command, walking five in four innings. He was able to limit the damage. however, to just two earned runs in four innings of work. Jake Cosart picked up the win in relief, throwing two no-hit innings with three strikeouts. A pair of home runs were enough to ruin Mike Shawaryn's night, as the 2016 fifth-rounder took a second straight loss. Shawaryn gave up four runs on six hits, while striking out four and walking four. Catcher Jhon Nunez led the way offensively for Salem, going 2 for 4 with a double, a triple, two RBI and a run scored. It was a rough night at the office for Darwinzon Hernandez who gave up nine runs (eight earned) on nine hits in 5 1/3 innings of work. Hernandez started off on the right foot, giving up just one run in the first three innings, but the wheels came off in the fourth. Tucker Tubbs went 1 for 4 with Greenville's only extra-base hit on the night with a double. First-round draft pick Tanner Houck was lights out as he continues to get stretched out as the season progresses. The Mizzou product hurled three perfect innings, striking out four and walking none. Denyi Reyes picked up right where Houck left off, hurling five shutout innings of relief to earn the victory. Twenty-fourth round pick Charlie Madden went 2 for 4 with a double and an RBI. Seventeenth round pick Frankie Rios went 1 for 4 with an RBI and a stolen base. The GCL squad was held to just two hits in the first game of a doubleheader on Tuesday. Oddanier Mosqueda was touched for five runs on eight hits in two innings of work. Jagger Rusconi went 1 for 2 with a double and a run scored in a rehab start. The Sox overcame deficits of 7-0 and 9-3 in a wild second game. Ricardo Cubillan reached base four times, going 2 for 2 with two walks, two runs scored, four RBI and a stolen base. Second-round draft pick Cole Brannen went 2 for 4 with a walk, an RBI and three runs scored. Pedro Castellanos went 3 for 5 with three runs scored. Ritzi Mendoza picked up the win with three innings of relief. It was a huge night at the plate for shortstop Ivan Houellemont, who drove in all six DSL Sox runs. The 18-year-old switch-hitter from Puerto Rico went 2 for 4, clubbing a grand slam in the sixth and adding a two-run single in the eighth. Juan Morillo threw four shutout innings in the start, giving up just one hit and two walks while striking out four. Player of the Night: While a couple players at the lower levels are deserving as well, the clutch factor for Michael Chavis gives him Player of the Night honors. Chavis has been on a tear of late, hitting in nine straight games to raise his average to .298. The home run was his third in six games.